Could vaccinating sepsis survivors reduce the risk of new infections and improve outcomes for patients? Sepsis is a common and serious condition. Patients who have recovered from sepsis are still at increased risk of new infections which can be life-threatening. The VACIRiSS Trial tests whether treating these patients with a very safe vaccine reduces the risk of new infections and lowers mortality. This trial will initially be conducted in six hospitals across the UK. 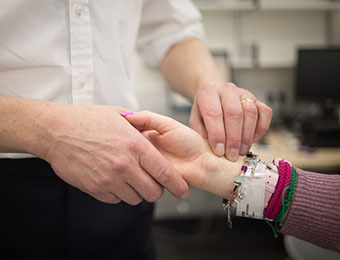 The trial is led by Guy’s and St Thomas’ NHS Foundation Trust, funded by the National Institute for Health Research (NIHR) and supported by the Biomedical Research Centre at Guy’s and St Thomas’ and King’s College London. In this trial, patients recovering from sepsis will be approached to participate. After obtaining consent, eligibility for the trial will be checked. Patients who are eligible will be randomly assigned to one of two groups, receiving either the vaccine or a placebo. Patients in the trial will be followed-up regularly for one year to see how they recover from sepsis – data will be collected using blood tests and questionnaires. After completion of the trial, we will assess whether vaccination enhanced the recovery of the immune system to reduce the risk of repeated infections. VACIRiSS is managed by the BRC Clinical Trial Management Research Platform. Kings Health Partners Clinical Trial Office are responsible for monitoring the trial, and KCL Clinical Trials Unit provide the trial database and randomisation system. A Trial Steering Committee, including independent members, will oversee the conduct of the trial. An independent Data Monitoring Committee is in place to safeguard the interests of study participants and protect the credibility and validity of the trial.